And, this was my exact thought as I was climbing Mt. Romance, snowshoes in hand, on my way to a 10k finish line. But, I’ll back up and point out a couple things about race day. This is my favorite race venue, but I have never run a short and sweet race here. 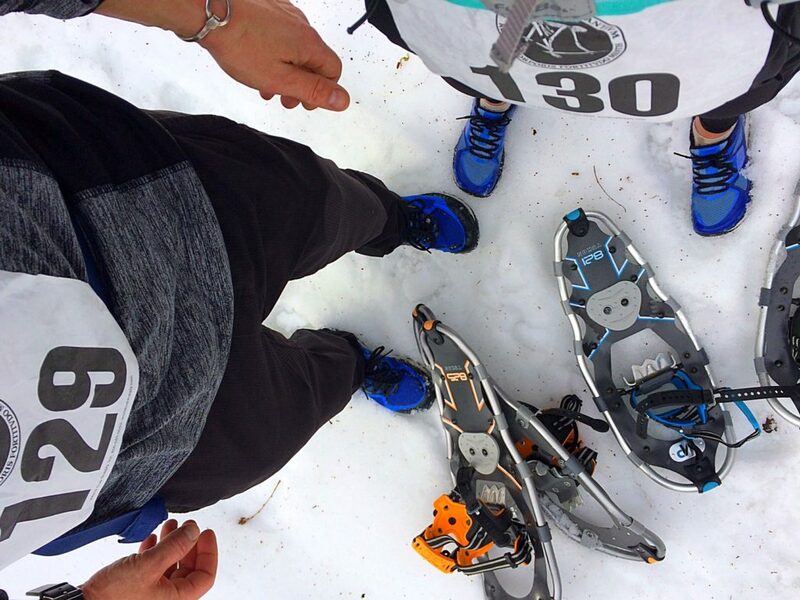 And, I’ve definitely never run a race in snowshoes. In fact, after an 8 mile snowshoe adventure in the winter wonderland that presented itself just the week before, I declared that I was never wearing snowshoes again. I guess I didn’t really live up to that overly vocal declaration. 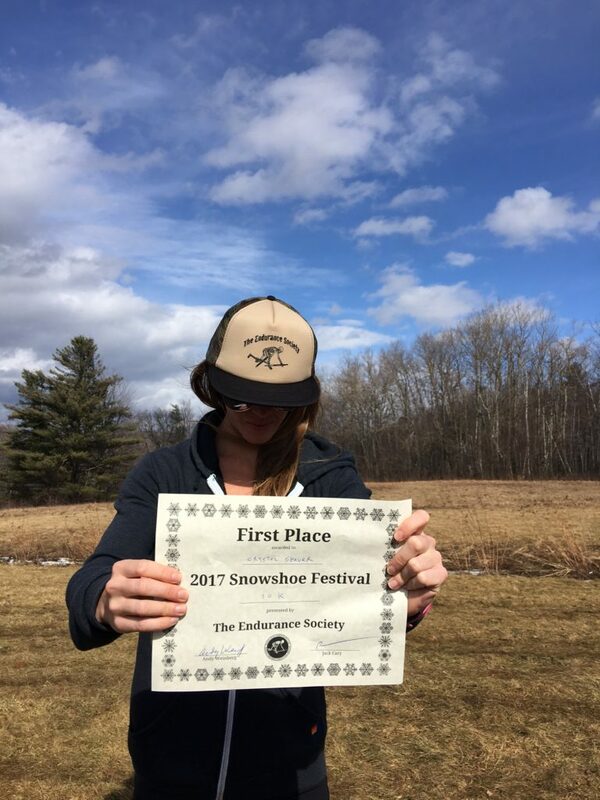 But, there is a first time for everything, including 60 degrees in February – which only meant early mud season, very little snow and a happy Crystal. If there is one thing I absolutely hate — it’s being cold. Saturday morning pre-race activities were easy – that’s because this was a training run, a well marked training run and it was short mileage in terms of current training numbers. But, where the miles were lacking, the vertical was not, and that is exactly what we wanted. Another perk? No gear bins needed. 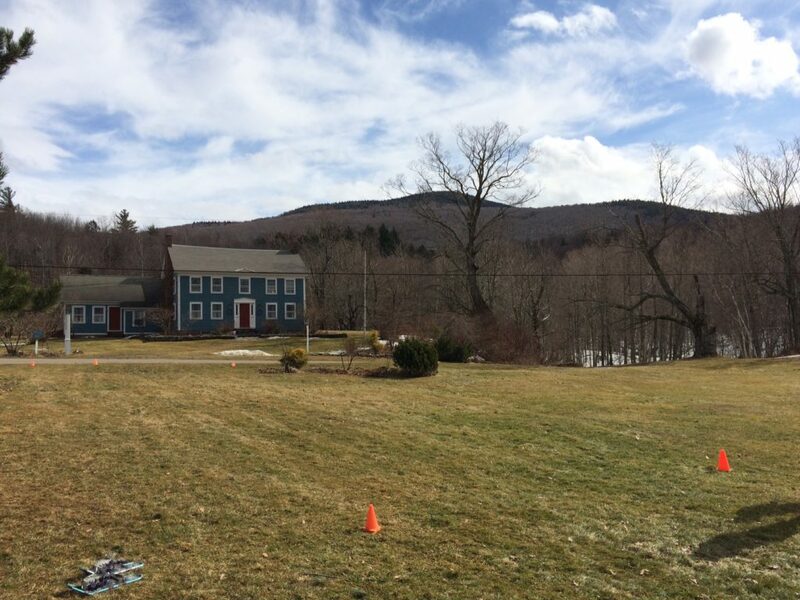 We had an hour drive from my parents house in Vermont to Goshen — to Blueberry Hill Inn and Ski Center. At 6:00 AM, it was REALLY foggy, then muddy and then breaking sunshine and warm. And, mixed in between all of those things, it was calm. When you arrive to Blueberry Hill, besides dirt, mud and bugs, you can always expect good company. The type of company that becomes extended family. 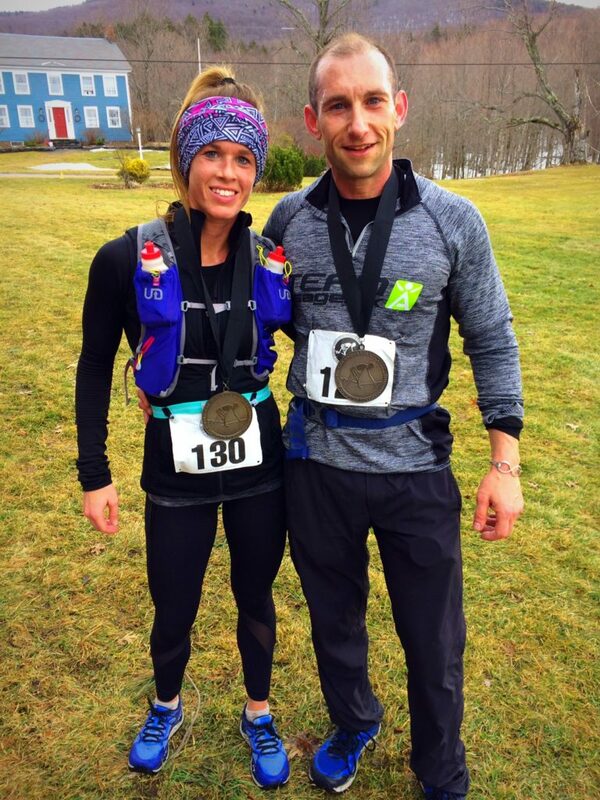 Smiling faces, hugs, race directors that know you by name – it’s just the norm here. And, I Iove that piece – the community and connection. Around 7:55 AM we lined up behind the cones [that’s the official start line], on GRASS, for the start of the race. Jesse and I decided to carry our snowshoes and run/hike until the snow presented itself at higher elevations. Others decided to wear their shoes from the start. And, we all waited for the cannon to go off before running across the road to start our trek up Mt. Romance. If this start line was competitive [not to be confused with a lack of competition because there are some incredible athletes that show up each race], you would have never known. It was simply laughable and awkward and completely Endurance Society – esque. The adventure up Mt. Romance. 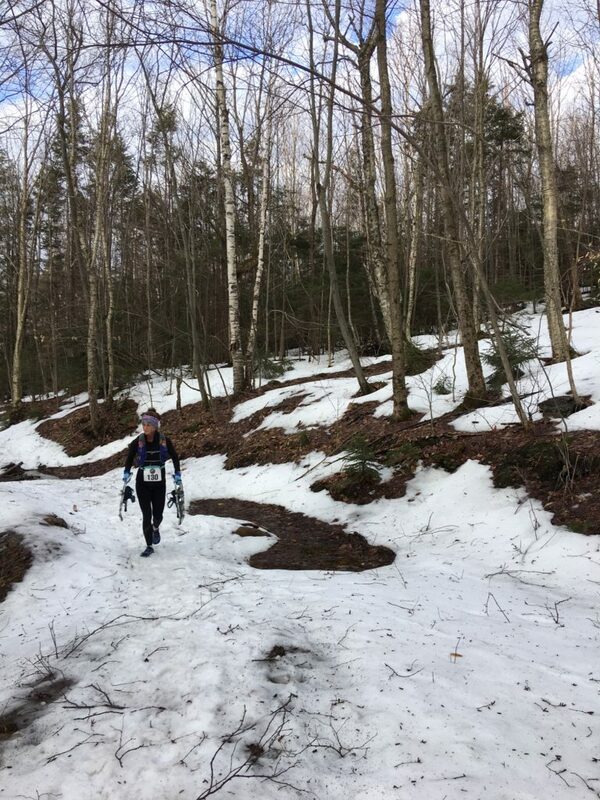 Basically, you ran [or climbed or did something that can only be characterized as slipping and sliding] on all types of terrain – mud, ice, slushy snow, knee deep snow, grass. Pick your poison – the footing wasn’t easy, but it was fun. And, the trail to follow, was up. And, up, and up some more. The constant climb caused the crowds to thin and I put my head down, tried to figure out what to do with the snowshoes in my hands, and climbed behind Jesse, [he somehow always manages to be a few steps ahead]. 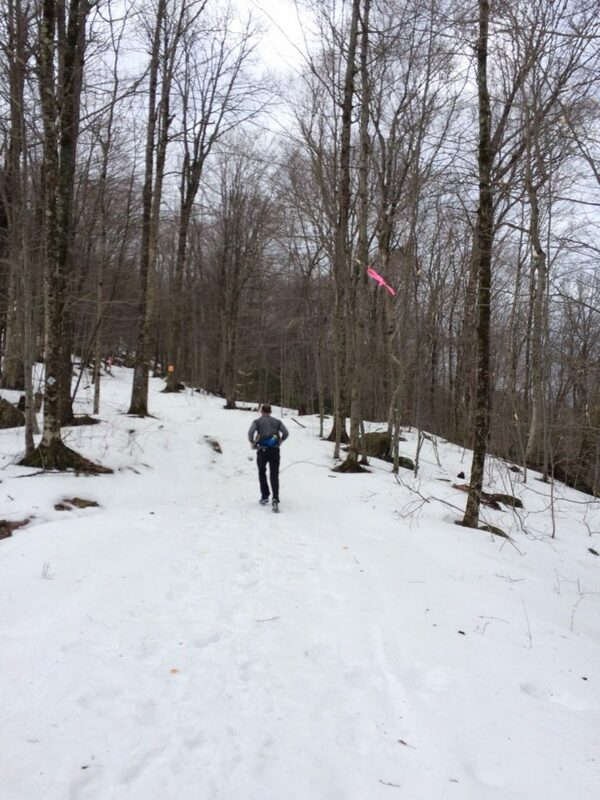 Sometimes we would climb, sometimes we would slip and sometimes we would sink knee deep in the snow as we reached the summit, but we kept going and we never found a real need to put the snowshoes on — post holing it was [apparently that’s what I have been doing all winter long…post-holing]. We crossed mountain streams with graceful leaping and we even crossed one by walking right on in and out — BRR. It was just a little too wide to jump. Yes, our feet were wet the entire time – and, if we had a further distance to travel, this would have been an issue, but we only had a few miles and dry socks waiting in the truck. When you get to the the top of the mountain [or any mountain], you have to come down. The downhill running was fast, the snow makes it pretty impossible to slow down, so you just go. Or, maybe I am just getting a little better at downhill running — either way, I still hate it. And, then the elevation evens out, and you work for each running step. But, we would run, albeit slowly and we would find consistency and power in the slow and steady. The race was only 7 miles. It was fun and challenging. We stopped to take pictures, to drink electrolytes and aminos, to look for another pair of lost sunglasses. We ran, but strolled. And, came back around Blueberry Inn, in the DAYLIGHT, to the finish line. Greeted by the Race Directors, Andy and Jack, I was surprised to find out we placed in the top 10 and that I was in fact, first place female. 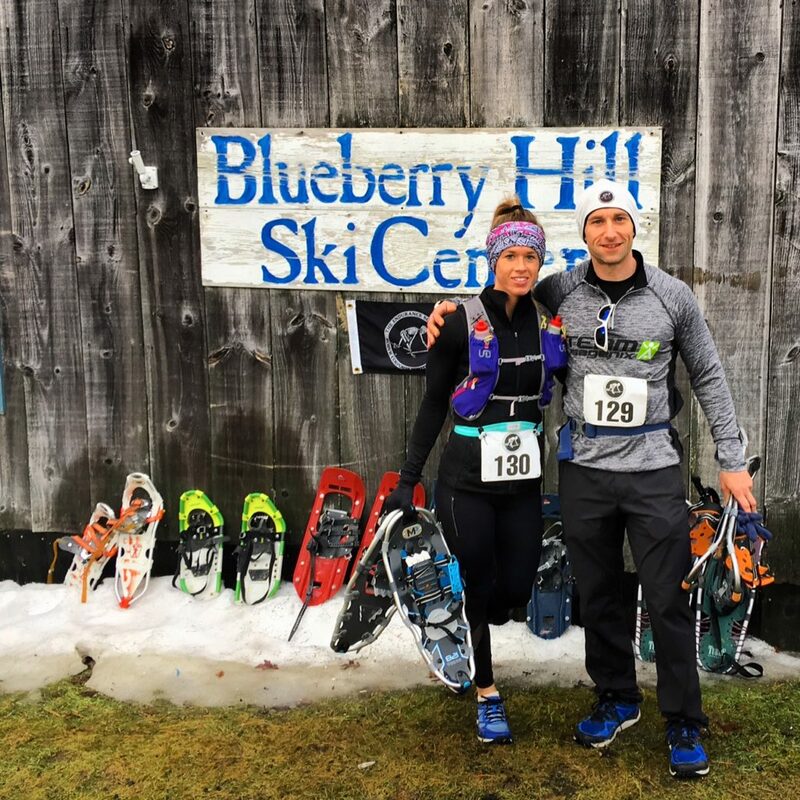 I did admit to never wearing snowshoes in a snowshoe race – but, I was reminded, we were only told to carry them with us. So, now I have my award – beautifully labeled and signed during free time on race day. I love the no glitz and glamour of the finish. And, I’ve said it before, and I’ll say it again, the placement is definitely not what made race day complete [a cupcake is still good without the frosting right..? – – that’s my point]. 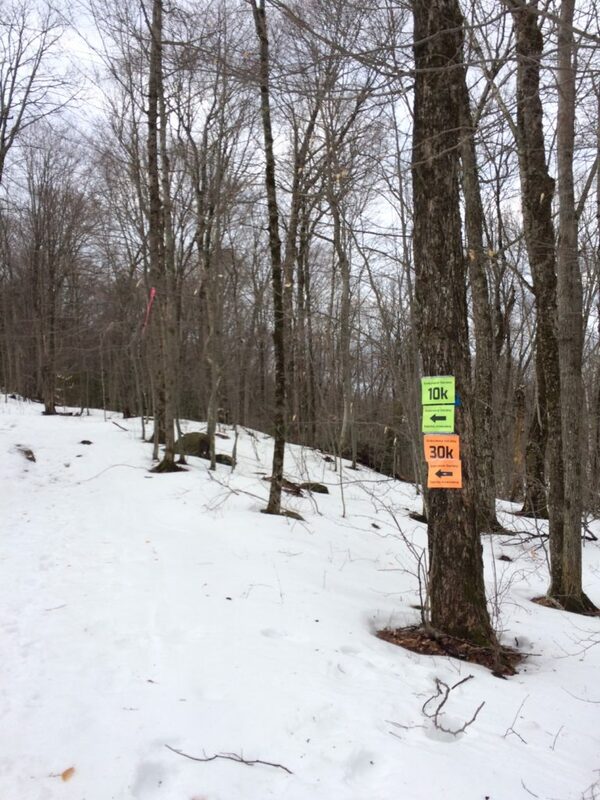 I never found a good way to hold those snowshoes – and, I am confident that by the end of 7 miles [yes, the math is always a little off in the Vermont woods], my arms were more tired than my legs. But, I had a great day. And, among many hard days lately, this was exactly what I needed. Pure happiness, pure love, and another adventure in the Vermont woods with Jesse. 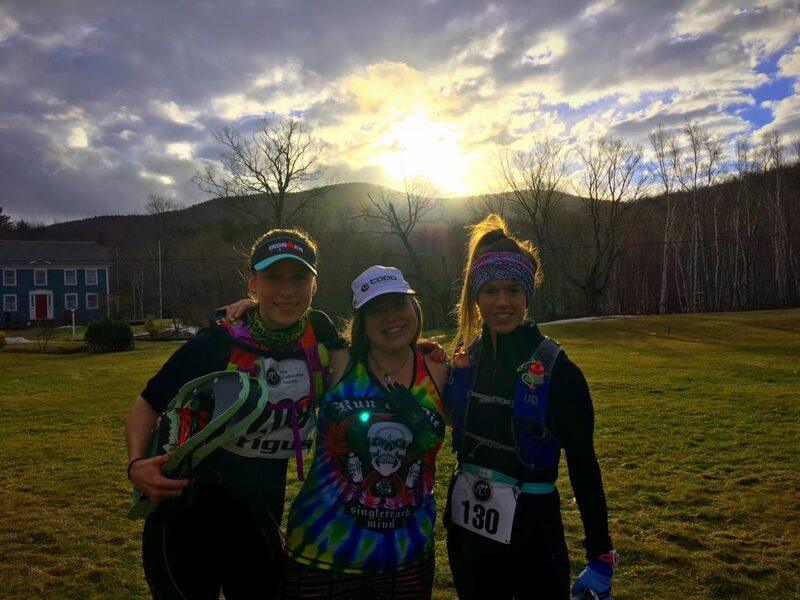 Now, on to Georgia Death Race and back to Vermont for 100 miles — this one won’t be so short and sweet – but, it will definitely be pure happiness, pure love and another adventure. 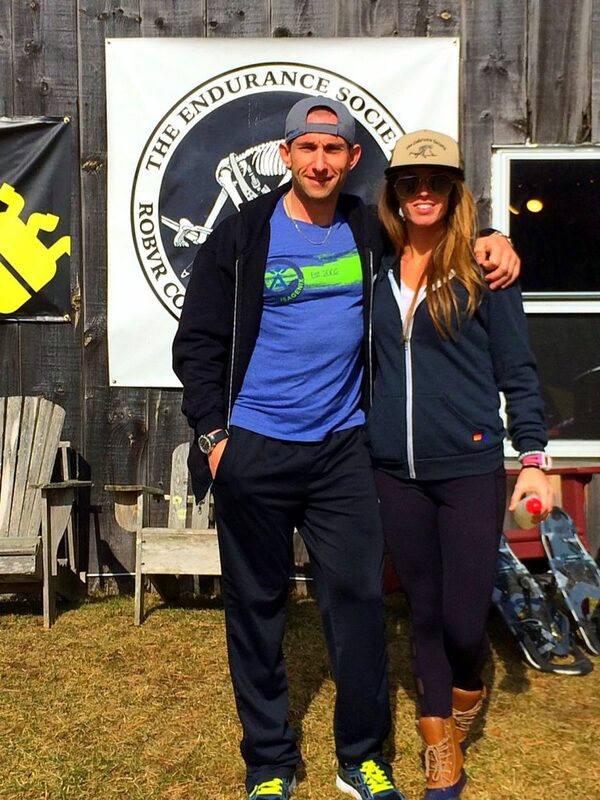 PPS – My Topo Athletic Terraventures and Goathead Gear Sole Spikes made this mountain adventure possible.